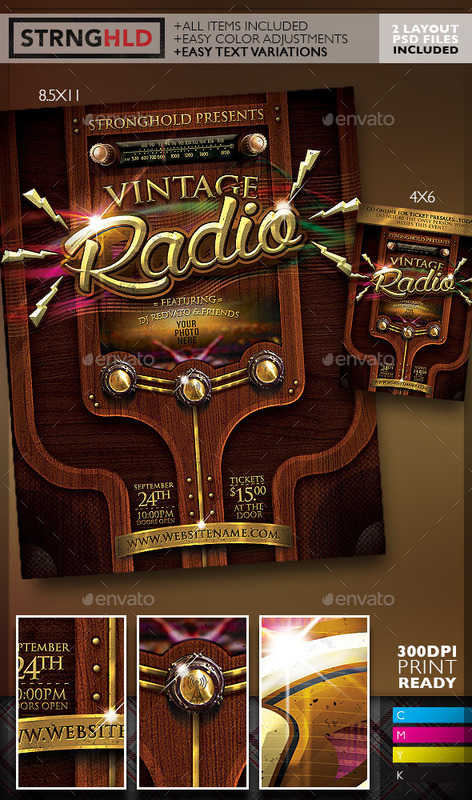 ABOUT: Need to have a simple and sweet radio or TV inspired retro look…Here is a great place to start! Vintage Radio Style Fun! INCLUDED : + TWO – ADOBE PHOTOSHOP CS3 FILES ARE 300DPI /CMYK AND CLEARY LAYERED INTO ZONES BASED ON DESIGN LAYOUT , WITH EDITABLE TEXT . FONTS: http://www.myfonts.com/fonts/linotype/trajan/ (MOST SYSTEMS HAVE THIS BY DEFAULT) http://www.dafont.com/wolf-in-the-city.fontFEEL FREE TO CONTACT US WITH ANY QUESTIONS OR CONCERNS .